Passing Yellow Funnel Spring the boardwalk climbs a low ridge and turns left to an observation platform, where you can overlook the central flat of Norris Back Basin. At first your attention is probably drawn to a busy spouter, occupying a prominent position directly in front of the observation platform. 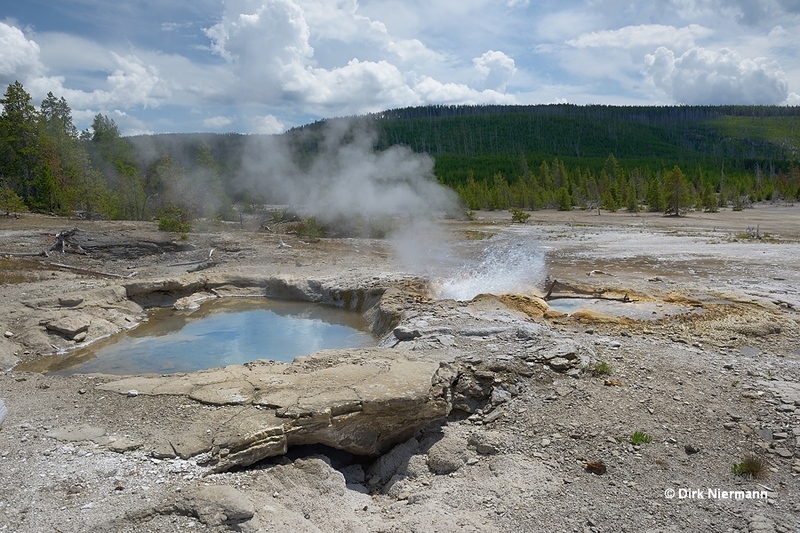 The feature is called Orby Geyser (or Orbicular Geyser), and is spouting most of the time. Around Orby Geyser many craters perforate the ground, some of them belonging to informally named features such as The Cousins or Xiuhtecuhtli (name of the Aztec God of Fire). They all are rarely active or extinct. 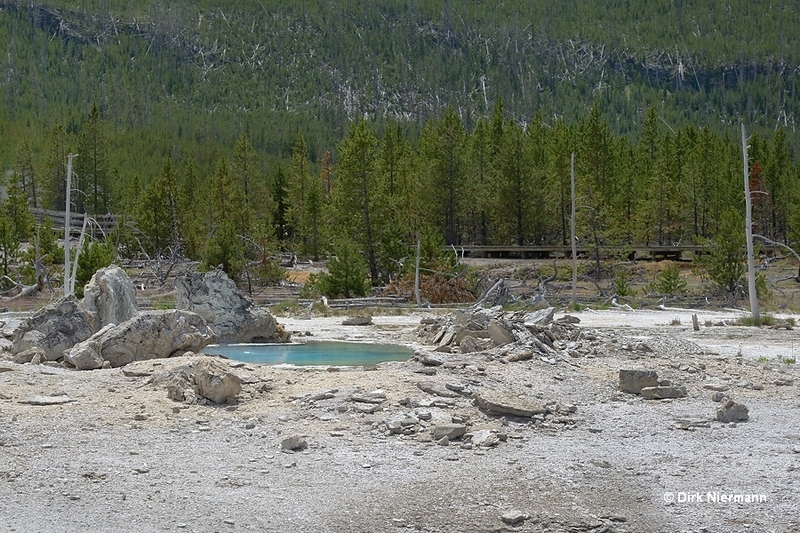 The area right (east) of Orby Geyser is partly obscured by trees flanking the boardwalk, and therefore often ignored. A closer look reveals at least two interesting features: Son of Green Dragon Spring and Grandson of Green Dragon Spring. Both are usually acting as perpetual spouters. Even further to the east are the positions of Daughter of Green Dragon Spring and Dabble Geyser. After the boardwalk has been rerouted in 2003 (one of the reasons was the appearance of Daughter of Green Dragon Spring next to the walk), both features can no longer be observed. The next stop along the trail is the spring NBBNN030 across the trail from Porkchop Geyser. 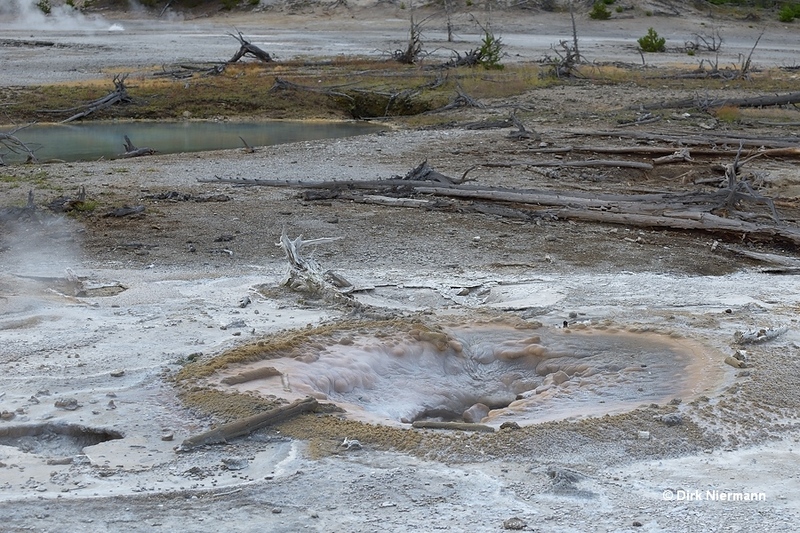 Porkchop Geyser may have the most dramatical known history of all features in Back Basin. Up until 1989 it was an occasionally active geyser, playing from a small sinter pool with the shape of a porkchop. 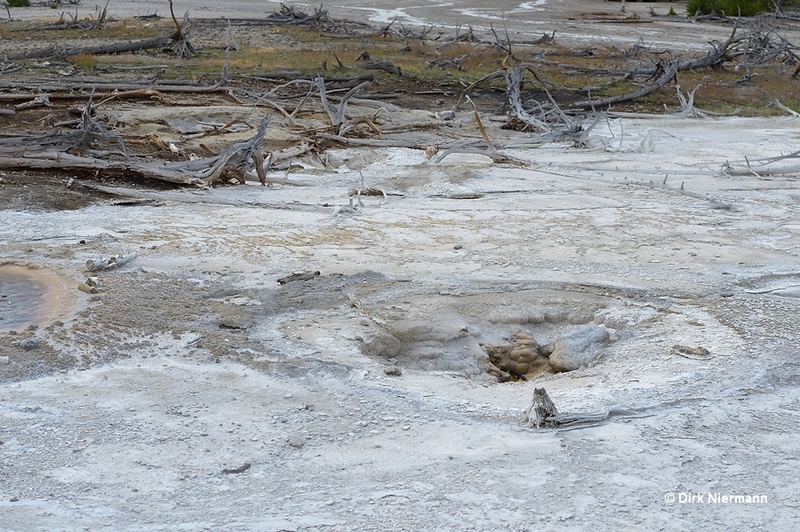 But the vent was sealed more and more by geyserite precipitation, so the pressure in the subterranean system rose and the geyser finally exploded in September 1989. 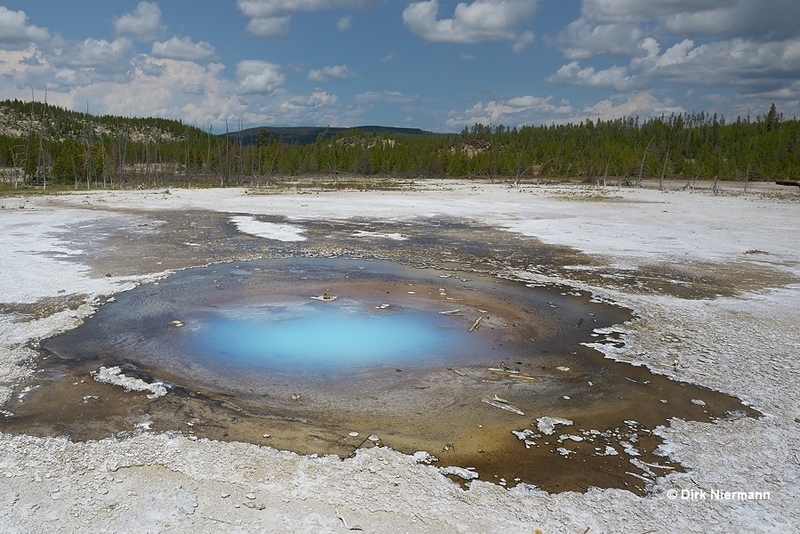 Nowadays the explosion crater is filled with opalescent blue water and is splashing from time to time. A few feet north of Porkchop Geyser a vent with the strange name Second Erupter quite frequently sends out angled jets of hot water. 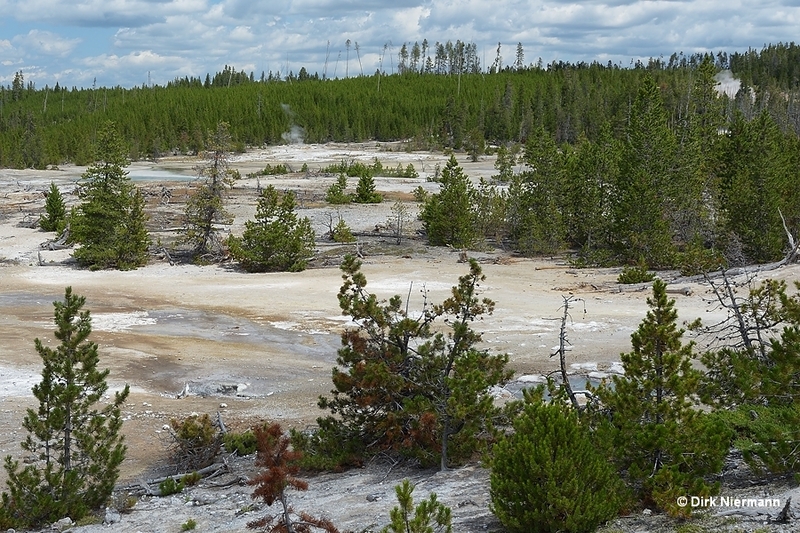 The area between Porkchop Geyser and Son of Green Dragon Spring is geothermally very active. Features may be developed and destroyed within a short period of time. 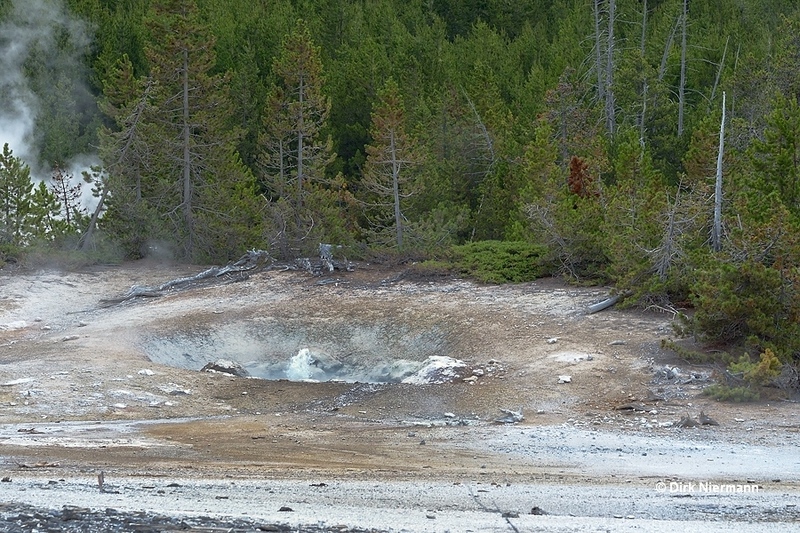 One example is Bastille Geyser east of Porkchop Geyser, which existed from 1992 to 1995. Now, many years later, the crater can no longer be identified with certainty. 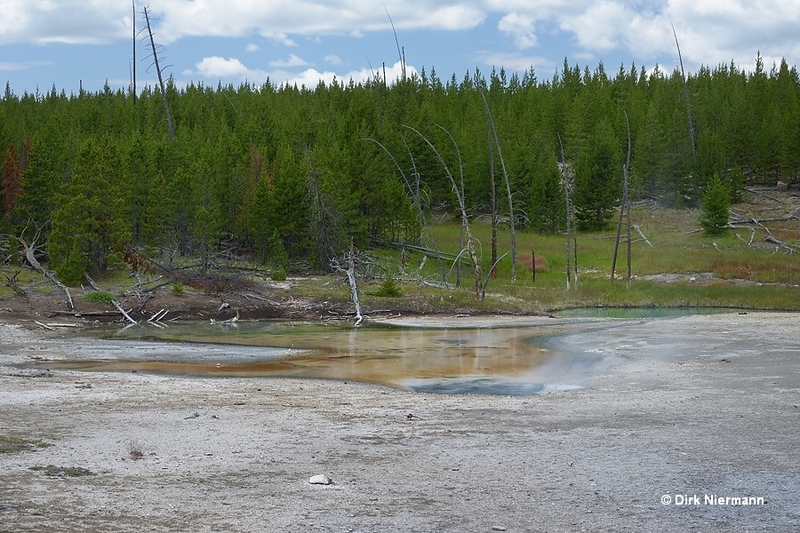 In contrast, nearby Double Bulger Geyser seems to be more persistently active, but is hard to see from the trail. Closer to the trail two craters catch the eye by their smooth and thick sinter lining. Byron Taylor let me know that this frequently splashing feature emerged probably around 2003 and is unofficially called "Sagebrush Lizard Spring". Southeast of Sagebrush Lizard Spring a pool with a small spouter on its west side catches the eye. 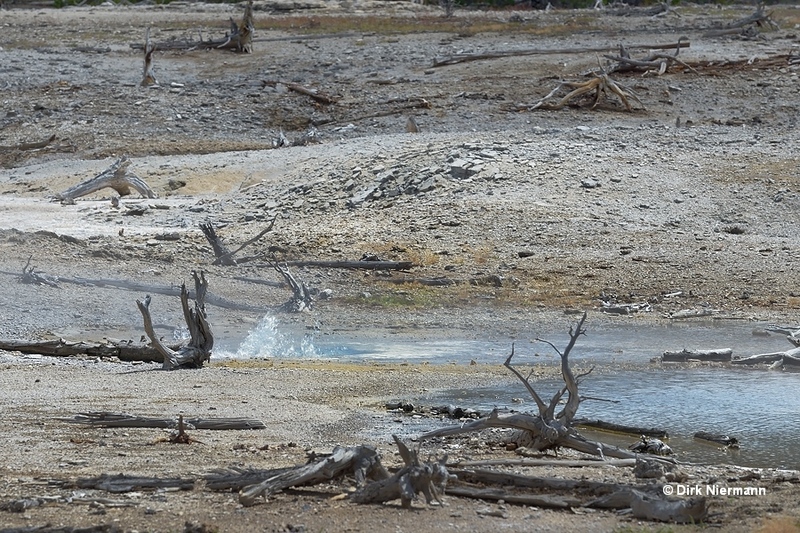 Its one of many nameless active features in the area, which probably will survive only for a short time. 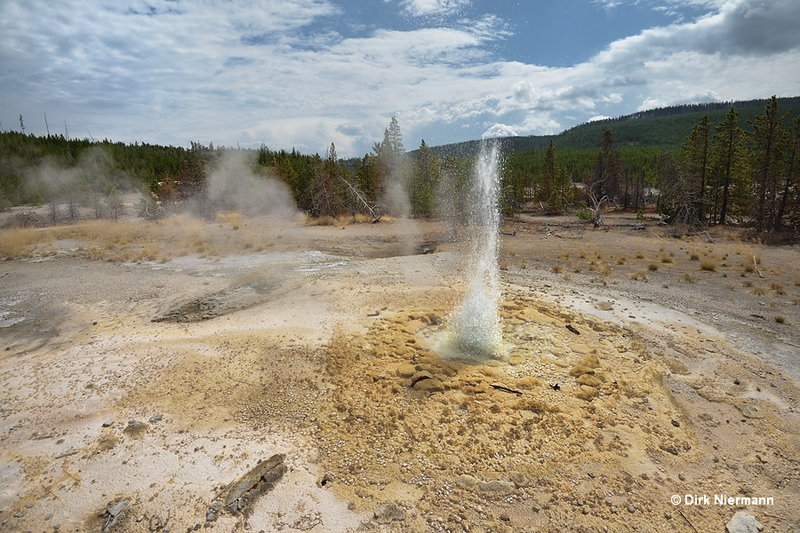 Pearl Geyser is very popular both because of its opalescent appearance and its sparkling eruptions. Sometimes the geyserite lining of the crater exhibits a pearl-like luster. However, episodes of eruptive activity are quite rare. 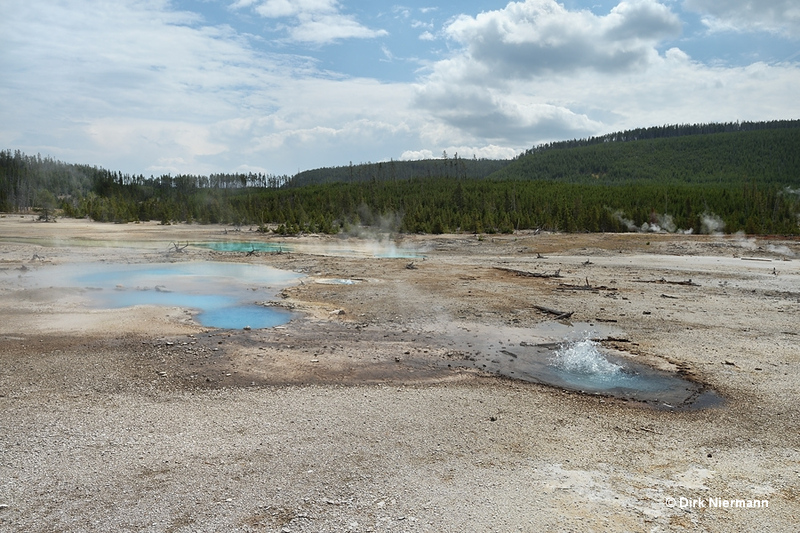 Looking east from Pearl Geyser you see an area with some deep, steaming holes and a somewhat larger hot pool in center. Surprisingly, none of the features seem to be documented in the RCN database. The next photo shows the changes in the same area caused by a disturbance 4 years later. The shot was taken with a wide angle lens, so the field of view is larger. For orientation, the gaping hole from the photo above turned into a cluster of opalescent springs on the photo below on the left side. Almost as popular as Pearl Geyser is Vixen Geyser a short distance to the north. Vixen is erupting quite frequently. 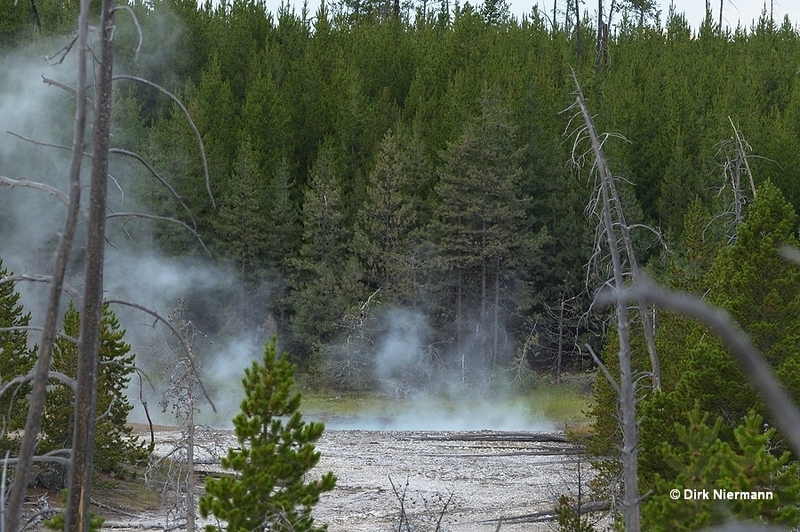 From the boardwalk between Pearl Geyser and Vixen Geyser two large steam plumes can be spotted behind trees in the west. The left one is from Psychedelic Steam Vent, a fumarole hidden in the forest. 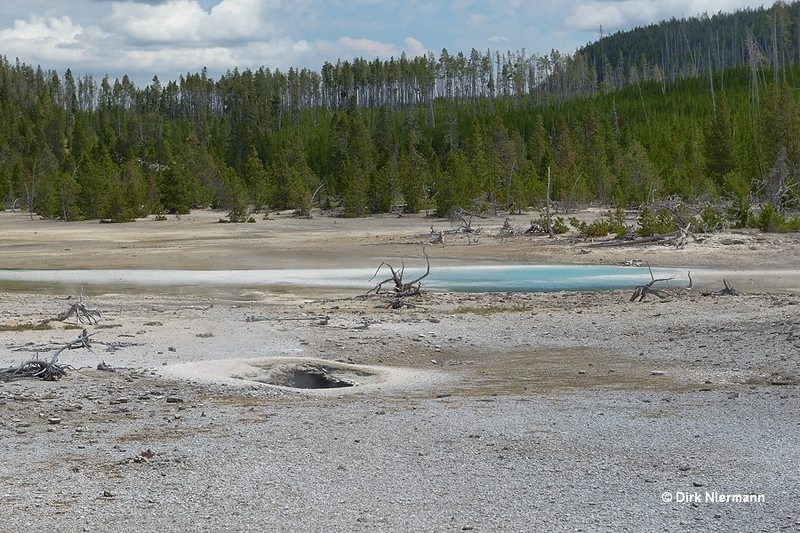 The other one is emitted by Recess Spring, which is sometimes acting as a geyser. There are a few positions on the trail, where you can catch a glimpse of it. Recess Spring is already more than 120 m (400 feet) off the closest boardwalk, but in the afternoon of June 7th, 2016, a 23-year-old man from Orgeon and his sister even walked beyond it. According to park officials, they were illegally looking for a pool suitable for so-called hot potting, the soaking in a natural hot spring. 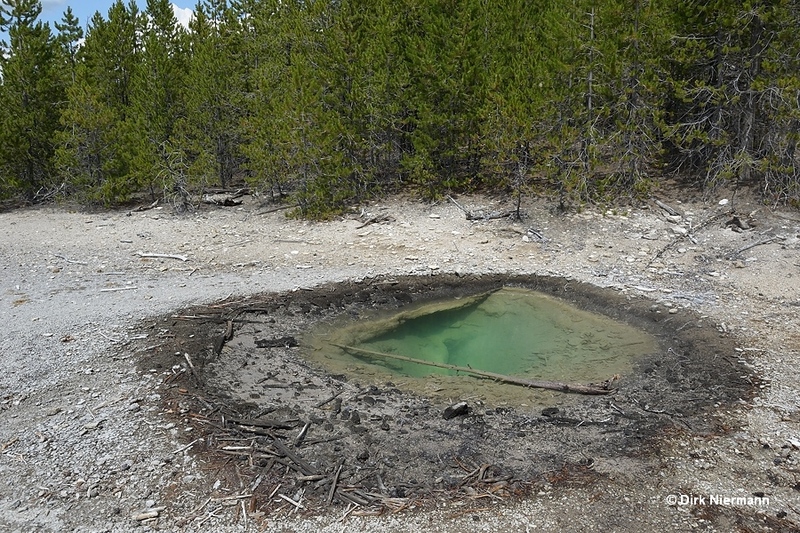 About 150 m (500 feet) north of Recess Spring the siblings came across Orpiment Spring, which is measuring less than 5 m (15 feet) in diameter and named after a yellow arsenic sulfide mineral. On the first look, Orpiment Spring might have appeared suitable for illegal hot potting because it is obscured from the boardwalk by trees. So the young man bent down to check the spring's temperature when he lost balance. 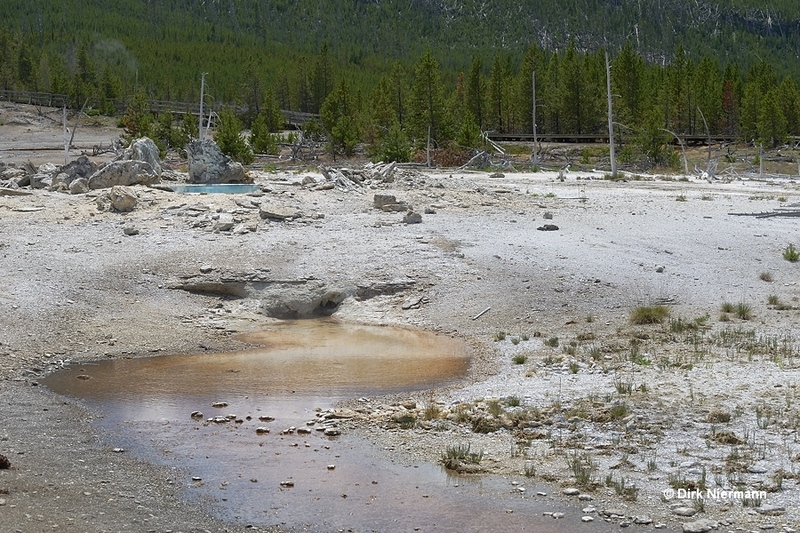 In front of his sister, who captured the whole incident on video, he plunged into the simmering pool, which was featuring an acidity of less than pH 5 and a temperature close to 93 °C (199 °F), the boiling point at this altitude. From that moment on there was no escape, he was inevitably scalded to death within minutes. Later that same day a rescue team found his flip flops and some other personal items on scene and saw the body inside the spring, but during the night the rescue operation had to be suspended due to dangerous ground and an approaching lightning storm. On the next day the recovery of his body was to no avail because the acidic Orpiment Spring did not leave anything to retrieve. Behind Vixen Geyser a branch of the trail leads to Veteran Geyser. Like Vixen it was frequently active, jetting water up to 7 m (25 feet) high and 15 m (50 feet) far out of its back vent. Another vent is on the far side inside the pool, a third one at the outer rim of the pool (on the photo to be seen just in foreground). The dark crater east of Veteran, Veteran's Auxiliary Vent, is also part of the system and shows eruptions of its own on rare occasions. 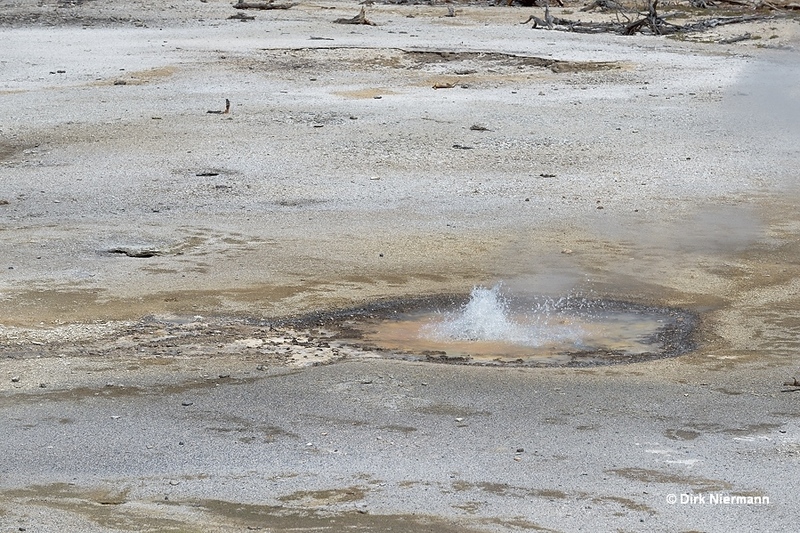 Concerning major eruptions, Veteran Geyser has been nearly dormant since 2003, with only a single eruption in 2004 and another one in 2015. 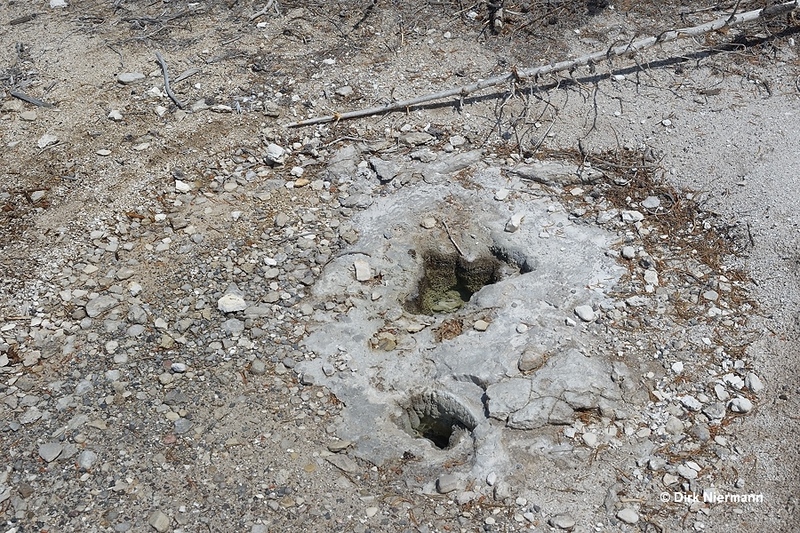 On your way back from Veteran to the main loop trail you come across Dog's Leg Spring and Coproral Geyser. Both show only weak eruptive action, and tiny Dog's Leg Spring is capable of playing even a little bit higher than Coropral Geyser.